As I was getting ready to go out, I noticed that one of my biggest servers was down. Huh. I say "noticed", I have a thing that notifies me of problems like that. So I went down to the data shed, and rebooted it. After a bit of persuasion, it came back up. Whew! Only a few minutes lost. Wow, it was cold today. I got out of the car, and as I was putting on my boots, I noticed that I was shivering, so I put in an extra layer of clothes, making five layers. That turned out to be enough. I then embarked on a marathon 48 cache circuit, over nine miles, and by the time I got back to the car, my thighs were starting to mutiny. My back wasn't too happy either. But I got back while it was daylight, and found all the caches. Total today, 62, and the last one was a devilish little titchy thing, in a mass of ivy. And when I got back, a letter from the Halifax was waiting for me, responding to my spam complaint and saying that they'd look into it. It says they enclosed their leaflet about complaining, but I think they forgot to put it in the envelope. Oops. 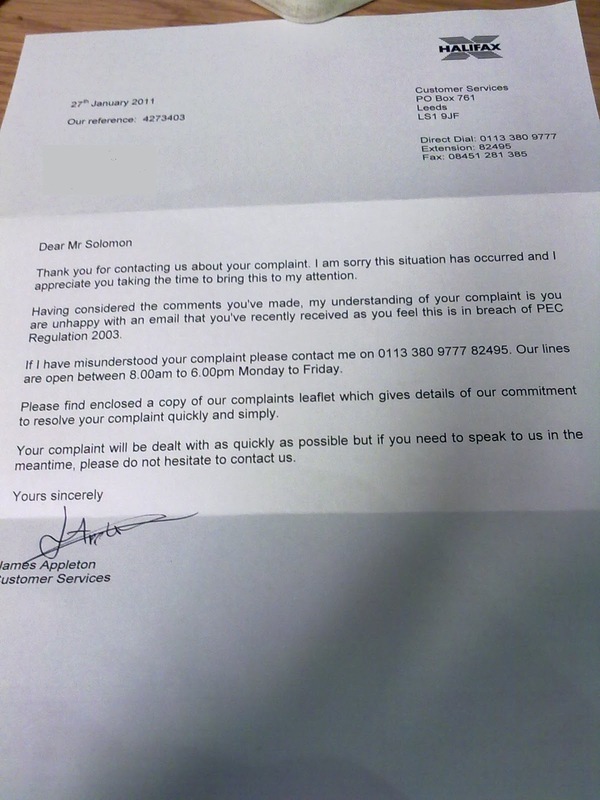 So I phoned them up to complain about that, and James Appleton said he'd get that into the next letter he sends me. Then I got a call from Joshua McNee, who works for ... another department at Halifax, I don't remember which one, but his number is 0845 6015917 and it was something like "Customer Service". He called to assure me that the complaint was being dealt with, which is nice of him, and he told me the reference number for the complaint, which is a different reference number from the other two I've had from Halifax, so I gave him the two numbers I already had, and suggested that they should coordinate their efforts, it might be more efficient. I also gave him the names of the four other people I've spoken to already at the Halifax (not counting switchboard operators) in case that helps him in pursuing the complaint. And he asked me for my address, which sort of baffled me, since the Halifax has, as you can see above, already sent me a letter on this issue. But it seems that my address isn't on the database that he has access to, that's on the database that James Appleton has. So I gave him my address, again. So far, I've located three support databases at Halifax. When this is all over, I'll have to ask them to take me off all three of them. I also asked him if he had copies of the offending emails, and he sounded a bit baffled; he sounded like he didn't know why they'd want them. Well, they should want them, because that's how they find out which of their affiliates is sending illegal spam. But Joshua is in one of their customer service departments (I know they have more than one, and possibly at least three, that's why I have three different reference numbers) and maybe he doesn't know that by reading the header information and source code of the html email it's possible to determine which affiiate sent it. So I expect when this complaint gets to someone who will actually take action on it (my original complaint was on January 16th, so it's two weeks and counting) they'll contact me and ask for another copy of the email. And possibly for my adddress again.